The lead climbing class is the “next step” in becoming a more complete climber. This class will teach the basics of how to lead climb indoors, including clipping fundamentals, lead belaying, lead falling, and lead catches. Due to the more technical nature, advanced degree of difficulty, and increased risk, climbers must demonstrate strong climbing skills and belaying techniques in order to take this class. 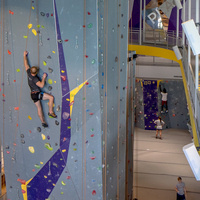 Lead Climbing 303 will be capped at 6 people per class and will require a minimum of 3 people to have the class. Must be top rope belay certified and able to climb 5.9 comfortably.